In this brilliant book of recollection, one of America's finest writers re-creates people, places, and events spanning some fifty years, bringing to life an entire era through one man's sensibility. 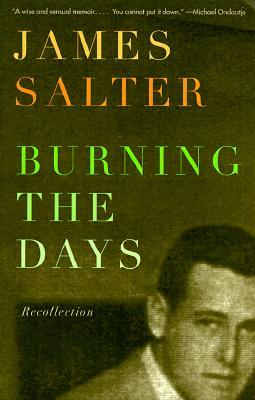 Scenes of love and desire, friendship, ambition, life in foreign cities and New York, are unforgettably rendered here in the unique style for which James Salter is widely admired. Burning the Days captures a singular life, beginning with a Manhattan boyhood and then, satisfying his father's wishes, graduation from West Point, followed by service in the Air Force as a pilot. In some of the most evocative pages ever written about flying, Salter describes the exhilaration and terror of combat as a fighter pilot in the Korean War, scenes that are balanced by haunting pages of love and a young man's passion for women. After resigning from the Air Force, Salter begins a second life, becoming a writer in the New York of the 1960s. Soon films beckon. There are vivid portraits of actors, directors, and producers—Polanski, Robert Redford, and others. Here also, more important, are writers who were influential, some by their character, like Irwin Shaw, others because of their taste and knowledge. Ultimately Burning the Days is an illumination of what it is to be a man, and what it means to become a writer. Only once in a long while—Vladimir Nabokov's Speak, Memory or Isak Dinesen's Out of Africa—does a memoir of such extraordinary clarity and power appear. Unconventional in form, Burning the Days is a stunning achievement by the writer The Washington Post Book World said “inhabits the same rarefied heights as Flannery O'Connor, Paul Bowles, Tennessee Williams and John Cheever”—a rare and unforgettable book. James Salter is the author of A Sport and a Pastime (now in Modern Library), Light Years, The Hunters, Solo Faces, and Dusk and Other Stories, which won the PEN/Faulkner Award in 1988. He lives in Colorado and Long Island.